Scott Amyx received the Gartner Cool IoT Vendor 2017, Cloud & DevOps World 2016 Award for Most Innovative and was voted Top Global IoT Influencer & Expert by Inc. Magazine, Postscapes, Top IoT Authority by the Internet of Things Institute, and Top 10 Global Speakers by Speaking.com. Scott is a thought leader, speaker, and author on the Internet of Things and the Managing Partner at Venture1st and CEO of Amyx+. Scott has been nominated to the World Economic Forum as a committee member for the Future of the Internet. Scott has been nominated by global luminaries for TED Talk. 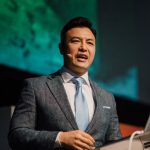 The Republic of Korea nominated Scott to represent cutting-edge research and case studies on the Internet of Things at the ITU Telecom World, United Nations 2015 in Budapest. Gerson Lehrman Group (GLG), AlphaSights, 10EQS, and other research firms look to Scott for unrivaled insights and pulse on the changing IoT landscape. Scott’s feature Wiley book Strive is scheduled to come out in late 2017/ early 2018. Find out how doing the things most uncomfortable leads to success. Pioneering thought leader Scott Amyx shows anyone striving to succeed, regardless of who or where we are, what we do or have done for a living, or how young or old we are, that the secret to outstanding achievement is not talent but doing the things uncomfortable he calls “strive”. Drawing on his own powerful story of an impoverished immigrant frequently told that he would mount to nothing, Amyx, now a celebrated venture capitalist and futurist, describes his meteoric rise from obscurity to prominence, which led to the hypothesis that what really drives success is not intellect, opportunities or even network but pursuing personal change that’s uncomfortable. In this book, Scott takes readers into his defining life moments and stories from some of the most unlikely individuals who persevered through change to become outrageously successful. He also mines fascinating insights from history and shows what can be gleaned from modern experiments in high performance. Finally, he shares what he’s learned from interviewing dozens of high achievers—from corporate CEOs, unicorn startup entrepreneurs to global policy leaders. Strive shows how you can shape your life and your career, a life of fulfillment and joy, constantly creative and productive, one that always holds the possibility of delightful surprise. Scott’s second feature book The Human Race: How Humans Can Survive in the Robotic Age is scheduled to come out in 2018. Scott explores the imminent net job loss from artificial intelligence, robotics, and the Fourth Industrial Revolution and its impact on income inequality and rise in populism and nationalism that are sweeping across the globe. He explores the advantages and disadvantages of basic universal income. Scott emphasizes the need to pursue job training and labor force development in human to human services that leverage our ability to empathize with the human condition. The empathy business models and services will become the bedrock of post Fourth Industrial Revolution. Scott has been featured on New York Times, TIME, Forbes, The Washington Post, WIRED, TechCrunch, Inc., Chicago Tribune, InformationWeek, Forrester, Gigaom, ReadWrite, Shots Magazine, Business News Daily, IBM Big Data & Analytics, Intel, Geektime, Examiner, TechBeacon, EE Times, IEEE, El País, Costco Magazine, and television and radio programs. He has spoken or scheduled to speak at TED, European Commission, World Economic Forum, ITU Telecom World (United Nations), International CES, Internet of Things World, IoT Asia, M2M Summit, Smart IoT London, Internet of Things Security, Wearable Technologies Conference, IBM Insight, IBM Amplify, IBM Watson IoT, IBM InterConnect, Cloud Expo Europe, Cloud & DevOps World, Internet Summit, Global Big Data, JCK Las Vegas, Customer Service Experience, IN3 Medical Device 360 Summit, Razorfish Tech Summit, Location & Context World, Wearables TechCon, K-Global Startup, and more. Scott is the co-author of Internet of Things and Data Analytics Handbook, an academic publication by John Wiley and Sons and The Advances in Information Security, Privacy, & Ethics (AISPE) Book Series: Managing Security Issues and the Hidden Dangers of Wearable Technologies, an academic publication by IGI Global. Scott has over 19 years of large-scale strategy and implementation experience, managing double digit million dollar projects across multiple verticals. In his last corporate position as VP of Product Management, Scott helped the company be acquired by a Fortune 500 publicly traded company. Scott has also started numerous startups and successfully sold a company. The function of the IoT Community, is to focus on the adoption & application of IoT in commercial environments, seeking to understand & contribute to applying the technology or overcoming the wide variety of barriers, inhibitors, and technical & operational issues. As a member of the board, Scott Amyx will provide impartial input and guidance to the overall vision, strategy and execution that is helping to shape the current and future direction for the IoT Community, as well as the broader IoT industry.